Elections Commission (EC) is probing the issue of a ballot box that was reportedly kept at the residence of an election official. EC revealed that it received reports that the ballot box sent to Kandoodhoo, Thaa Atoll, had been kept at the residence of the individual appointed as the island's focal point for the upcoming presidential election. The commission stated that it is currently looking into the issue. According to Kandoodhoo Island Council's President Ali Nasih, the ballot box had been taken to the focal point's residence on August 30 before he delivered it to the council office on Sunday night. Nasih stated that the focal point claimed to have forgotten to hand in the ballot box. "He took the box when it arrived by boat on the 30th (of August) and took it home. We don't know what happened to it afterwards. But after talks started spreading on media, he handed the ballot box to the council sometime last night," narrated Nasih. "As far as we know, the box should have been kept at the council." 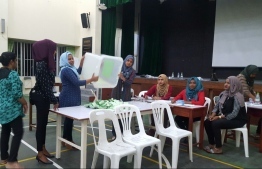 Nasih noted that the focal point was involved in ruling Progressive Party of Maldives (PPM) activities, and stated that residents were concerned that the ballot box had been kept at his residence. Nasih added that the action raised concerns of possible influencing of the votes. The issue was reported to EC by the council. This issue comes amidst public criticism over the appointment of PPM activists as officials and focal points at voting centres for the upcoming election.